In the remainder of this blog post I will pinpoint some problems of the choice of PDF/A and its justification. which contains 13 decimal places. Since Excel internally stores numbers at a precision of 15 significant figures, only the latter corresponds to the actual (stored) value. So, the PDF only contains the values at Excel’s displayed precision (in this case typically 9-10 significant figures), and the remaining precision got lost in the conversion. 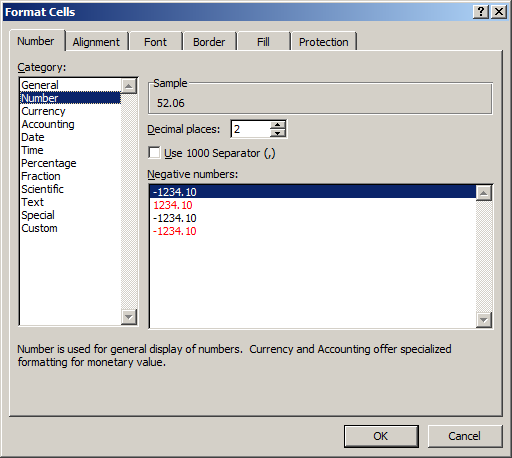 In addition, unlike the source spreadsheet, the PDF only contains static numbers. This means that information about the relation between the values in Columns A and B (i.e. the formula) is completely lost. Interestingly, exporting to a comma-delimited text file resulted in the same loss of precision! See the exported CSV file here. For brevity I won’t go into any further detail on CSV, but it’s important to be aware that this issue exists. 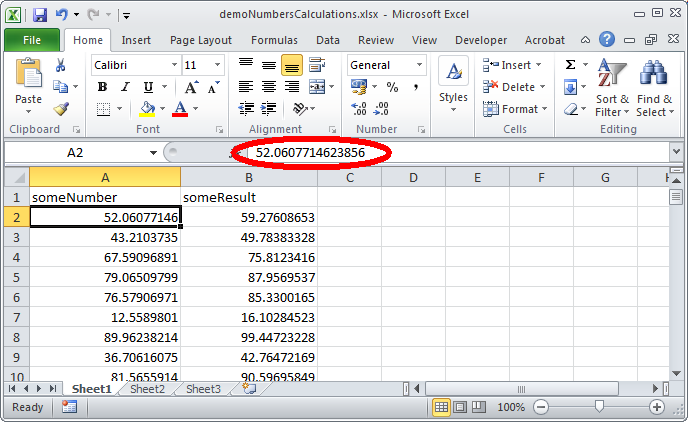 Moreover, this approach gets extremely cumbersome for spreadsheets that contain numbers at different precisions (e.g. it is pretty common to have one column with integer values, and another one with floating-point numbers). So in this case even more information is lost! This statement is problematic for various reasons. First, whether functionality is deemed ‘essential’ largely depends on the context and intended user base. By stressing the interactive aspect, the authors imply (perhaps unintentionally?) that any spreadsheets that do not take any interaction with a user can be safely converted to PDF/A. But what does ‘interactive’ mean in this context? Taking my earlier sample spreadsheet as an example: a user may ‘interact’ with that spreadsheet by changing the values in Column A, after which all values in Column B are recalculated. Does that make it interactive? If yes, applying the ‘interactivity’ criterion like this would cover any spreadsheet for which the value in any cell is dependent on one or more values in other cells. This applies to most spreadsheets, apart from those that only contain static data. But in that case a distinction between ‘static’ and ‘dynamic’ spreadsheets might be more useful2. Finally, I’m quite puzzled how a PDF/A representation of a spreadsheet is meant to be read. Who are the intended users? What is the target software? What is the context? Sure enough a PDF may be sufficient for on-screen viewing, but what if a (future) user wants to recover the original row and column values? Excel is not capable of this (in fact it cannot even import a PDF at all)? What if someone wants to use the data for some actual calculations? Data extraction from PDF is notoriously difficult (hence the phrase "pdf is where data goes to die"), which is mainly due to the lack of structure of the format3. The above observations only scrape the surface of the perils of using PDF for spreadsheet data. To be clear: there may be situations where PDF/A is a good (and possibly even the best) choice. For example, spreadsheets are often used for printable forms, and having these as a PDF/A representation may be perfectly fine4. Nevertheless, NANeth’s recommendations on choosing between their ‘preferred formats’ appear to be suboptimal, because they do not take into account the purpose for which a spreadsheet was created, its content, its intended use and the intended (future) user(s). In particular, using ‘interactivity’ as the main criterion seems somewhat dangerous. First of all thanks to Johan for the interest taken in our preferred formats document and the feedback given in this blog. All of the arguments he makes about loss of precision are correct. That’s why we selected ODS as preferred and XLS, XLXS as accepted formats. Incidentally, the finding that CSV has precision issues was new to us and is certain to be part of our evaluation of our preferred formats document. In this document we provide 2 lists: preferred and acceptable formats for different information categories (not only spreadsheets, but also including text documents, image files etc). A format is preferred when it’s an open standard as defined by the so called Forum Standaardisatie, a government agency dedicated to promoting usage of open standards in the Dutch central administration. Acceptable means it’s not (fully) open and documented but we already have the experience and the strategies in place to ensure longtime archiving. The reason we included PDF/A – one of the formats included on the Forum Standaardisatie list – as one of our preferred formats is that in our experience spreadsheet are not only used for, say, complicated calculations but also to store plain text in a table format. In these kinds of spreadsheets, the individual cells do not interact with one another and what you see on your screen is all there is to it. In these cases – exclusively – we feel that PDF/A is an appropriate format for long term archiving. That’s what is meant with the phrase “Note: some (interactive) functionality will not be available after conversion to PDF/A. If this functionality is deemed essential, this will be a reason for not choosing PDF/A”. We call it interactive, Johan calls this dynamic, but I think we mean the same thing. To prevent misunderstandings we’ll probably explain in more detail what is meant by ‘interactive’ in future versions. I had a chance yesterday to talk to Johan and we both concluded that spreadsheets are tricky. Feedback like his remarks are indeed appreciated and will be used to improve and update our preferred formats document in future versions.